8-3-2018 Updated the flowers to show in neighborhood view & not to be sold like furnishings with a house. 6-3-2012 Added a collection file. Be sure to drop this in your Sims 2 Collections folder and not your downloads. 11-11-2012 Removed the visible seam down the middle of the Sims 3 firepit mesh. If you want the improved mesh download the HW_firepit_EP-Required file and allow it to override your existing packages. 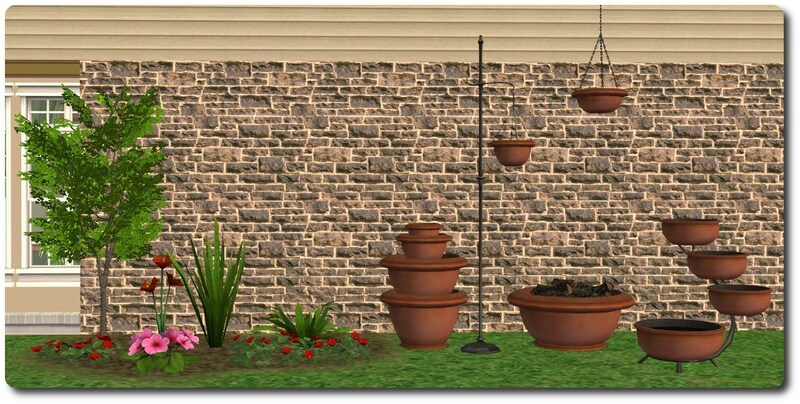 3-28-2013 delonariel shared a wonderful set of plants and planters converted from Sims 3 that you can use with the garden plot here . Back in 2010 I discovered Jonesi's bed blanket slaves and I was instantly hooked and decided I needed to make some of my own. The only problem is the set I came up with was/is so huge I could never manage to finish any of it before I was off on another wouldn't-it-be-cool project so I decided to break it down into more manageable sets. The problem with that idea is that once I had a smaller subset--like say outdoors--I decided some flowers would look nice...in a planter of course...with a fire pit...and do you know what I would really love? A container garden...and on and on it went. Some of what I came up with is beyond my capabilities for right now, some of it was just awful now that I look back but a lot of it I still really love and I'm excited to share even though everything isn't exactly how I'd like it to be. But after two years I figure I should just share this already while there's still people who might enjoy it. All of the fabric in this set is slaved to this one mesh. Without this mesh most of the Shady Patio Furniture (anything with fabric) will flash blue. I've attached the mesh if you need it but I encourage anyone who might not have her bed blanket to follow the above link for additional recolors--you'll need to be registered to see the thread. A nice texture for Jonesi's Bed Blanket that comes in a huge palette of colors, 100 at last count. You can match just about anything with this set. 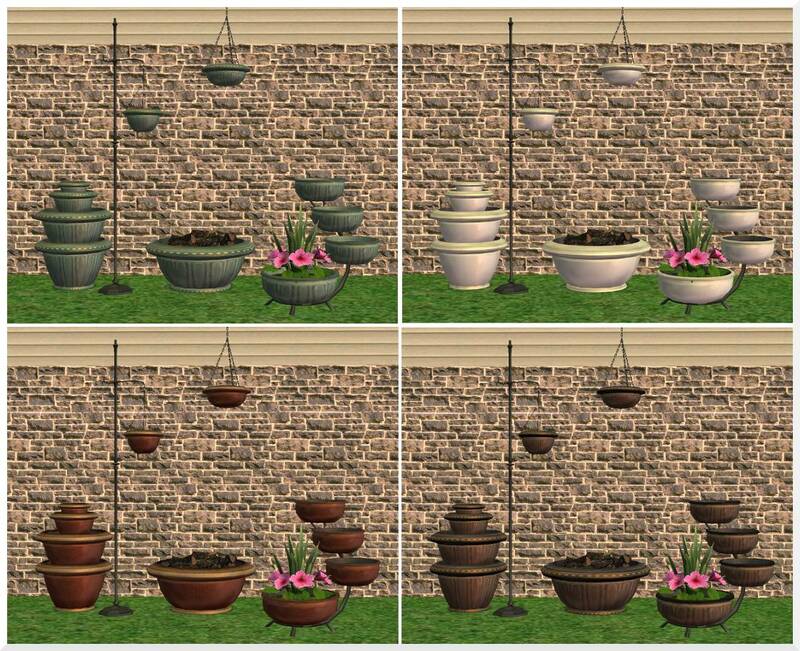 Stop your sims from stashing their bills and coffee cups in your planters when you use the stackable flowers by themselves. A versatile set of patio furniture that's nice enough to bring inside. It comes in five Maxis Match woods and with the thousands of fabrics available for Jonesi's bed blanket it's like the Sims 2 version of Create-A-Style. The drawback of slaving all of the fabric to another mesh is that you lose the shading that's possible with a custom texture but I think the versatility is worth the trade-off. In keeping with the versatility theme, the loveseat cushions and umbrella are separate pieces and are shiftable with Apartment Life. The tables are oversized and will clip into very pregnant sims and if butted up against a wall. Master to the Shady Patio & End Tables. Slaved to the Shady Umbrella Table. Slaved to the Shady Patio Table and Jonesi's Bed Blanket. Slaved to the Shady Patio Table. Modified Maxis mesh and textures. Slaved to Jonesi's Bed Blanket. Master to the Shady Chaise Lounge, Shady Loveseat and Loveseat Cushions. Slaved to the Shady Dining Chair. Slaved to the Shady Dining Chair and Jonesi's Bed Blanket. These planters and flowers were cloned from Silent Lucidity's OMSPs and retain all of the same functionality: They hold a wide variety of objects including heavy sculptures, live plants and outdoor lights. They can be placed on the ground, counters, all sized tables, and shelves. 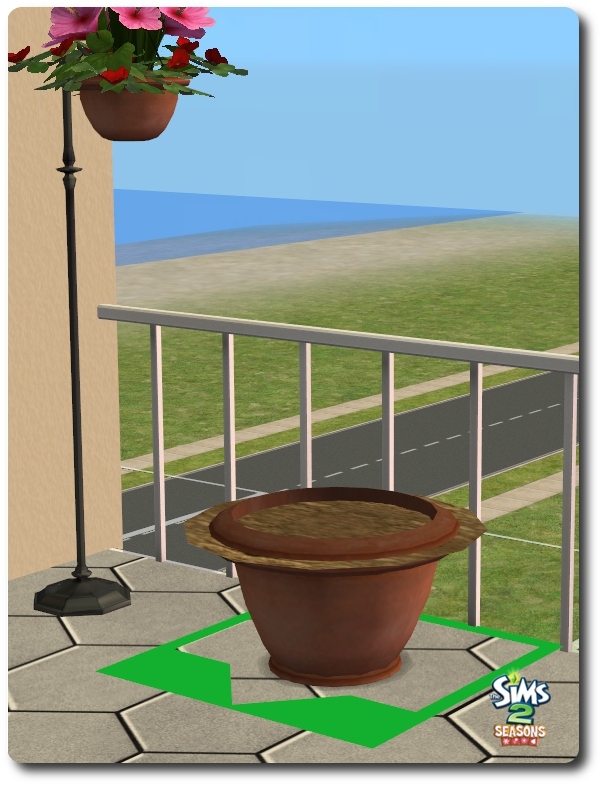 Sims can also interact and tend anything placed in them so they're perfect for live shrubs, flowers and allow for the possibility of container gardens. And since some of the plants as well as the planters have slots it allows you to combine flowers, plants and just about anything else you can think of and plop the whole mess into a planter that, again, you can place just about anywhere. If you're easily amused like I am this set will keep you entertained for hours trying out different combinations but I've finally come to the conclusion that two or three objects look best but some truly monstrous combinations are possible if you work at it long enough. In addition to the features that are inherent in the OMSPs, the two smallest planters (small & tiny) are also enabled as center pieces and all of the planters and flowers are height adjustable with Apartment Life for even more placement options. I also took care that none of the flowers or plants will clip through the walls when placed. You can even place the slightly oversized tree in a corner and as long as you face the "good" side towards the room the branches won't poke through the walls. Simply lay out the pieces you want to stack together on the ground and start stacking from left to right. The first piece you stack should always be the object without any slots. It's also important to note that if you pick up the stack and all of the objects aren't grouped together you need to use the Esc key and try again. If you don't you may need to start over from scratch. It can seem a little tricky at first but once you get the hang of where to grab to pick these up it's a simple and quick process. Any slots that are left open can and will be used by your sims to shove mail, newspapers and the like into your landscaping. 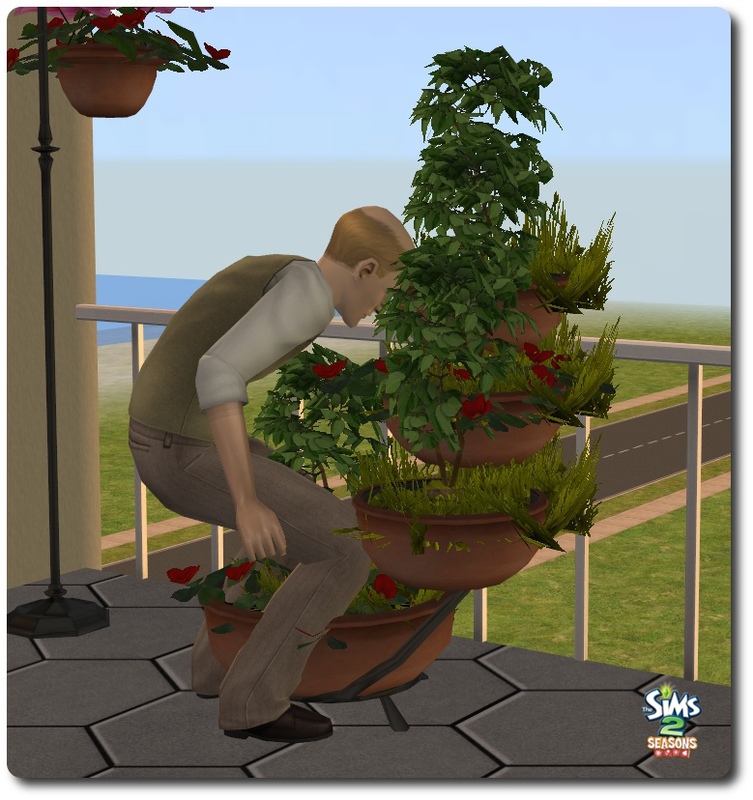 For me personally, I find it entertaining when my sim puts the newspaper in the planter next to the couch or shoves the bills in the bushes on the way back in the house so I haven't made any effort to block open slots but I can see how it could be annoying for other simmers. If it becomes a problem for you (and you don't have any non-slotted plants or deco objects you want to use to fill the slot) than Feenwald's Slot Blocker will do the trick. Master to all sizes of the Garden Stackable Planters. Slaved to the Garden Stackables Large Planter. 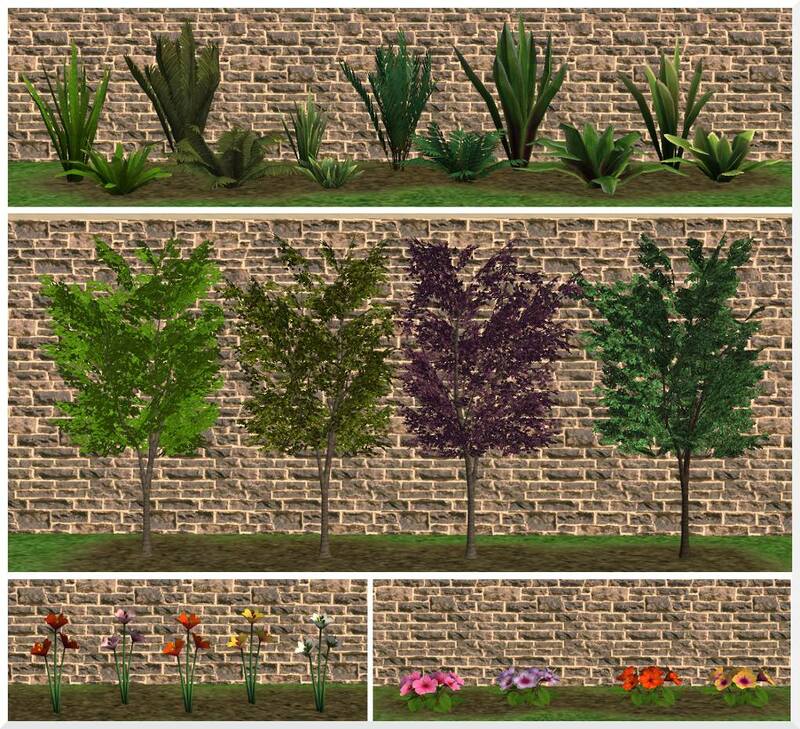 This is simply a cloned garden plot that can be placed in planters and allows your sims to have container gardens. This is probably my favorite part of this set since it lets me enjoy the gardening aspects of Seasons in a different way and on lots I never would have placed a garden or green house before like urban or apartment lots. Green houses and farm rows of vegetables look out of place in even some of my suburban yards but a few plants on a patio always looks great. When you buy the plot from the catalog you'll have an over sized disk that will snap into the planter slots--the medium, large and tiered planters work best--and will then turn invisible. Once placed, you'll have all of the gardening options you'd have from the normal garden plot. If you make a mistake placing a plot you can just grab it with the hand tool to reposition or you can scroll over the area with the hammer, the invisible garden plot will be highlighted and you can just delete it. An alternative use is to place the garden plot on one of the flowers first and then put that in the planter for some added color. Doing that also acts as a work-a-round for other planters that otherwise wouldn't be able to hold the garden plots. The garden plots can only be fertilized once and will remain fertilized after harvest so they never need to be fertilized again. Since that seems more like a feature than an issue to me I didn't spend all that much time trying to figure it out but if I find a solution I'll be sure to offer a fixed version. There is also some pretty major clipping that occurs while tending the upper slots of the tiered planter (the planters with only one slot are fine). I did my best to minimize it but since adjusting for one slot on the approach borked it for another I wasn't all that successful. 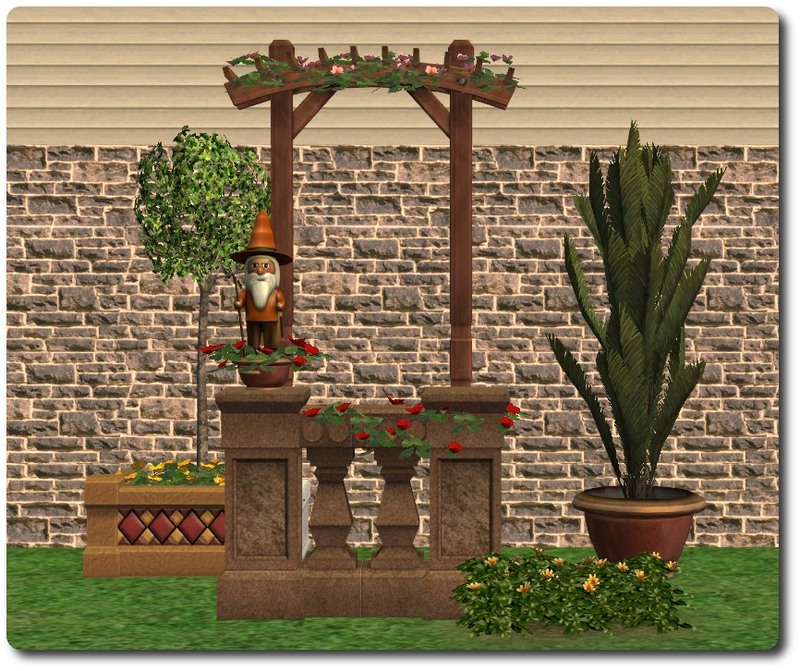 But I like the look of the tiered planter and it's a huge space saver so I decided to share it anyway. Some other minor issues using these are that it's hard to tell which plant you're clicking on when using the tiered planter. I finally realized that the plants have a subtle highlight when you run the cursor over them and since I've started to look for the highlighted plant instead of where my cursor is pointed these have become much easier to use when trying to pick out an individual plant. And finally, the square directly in front of the tiered planter and to the right need to remain clear if filled with garden plants so your sims have access to all of the slots. The fire pit that's shown above (that matches the planters) was cloned from the Bon Voyage campfire and has all of the same interactions and animations as the campfire does. The only difference is your sims will use a bbq fork to roast their marshmallows instead of the campfire stick. 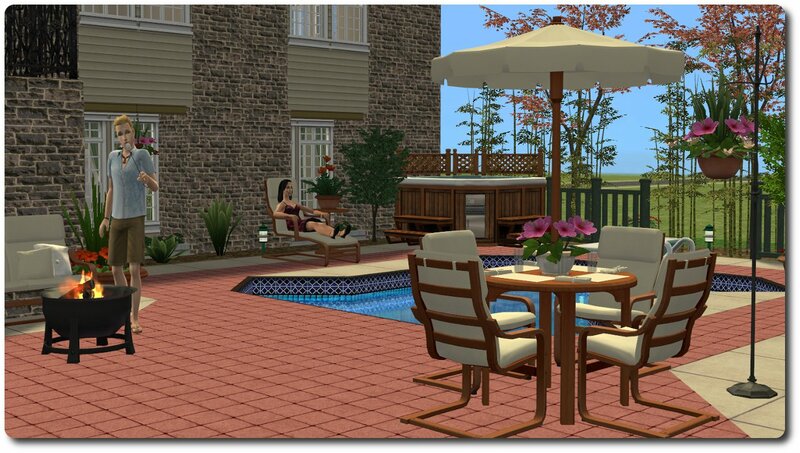 The black fire pit (pictured in the first picture at the top of the page) is the Portable Fire Pit from the Sims 3. It was cloned from a fireplace so it has those interactions in addition to the roast marshmallow interaction. Your sims will use the skewer from Sims 3 instead of the stick for this one. 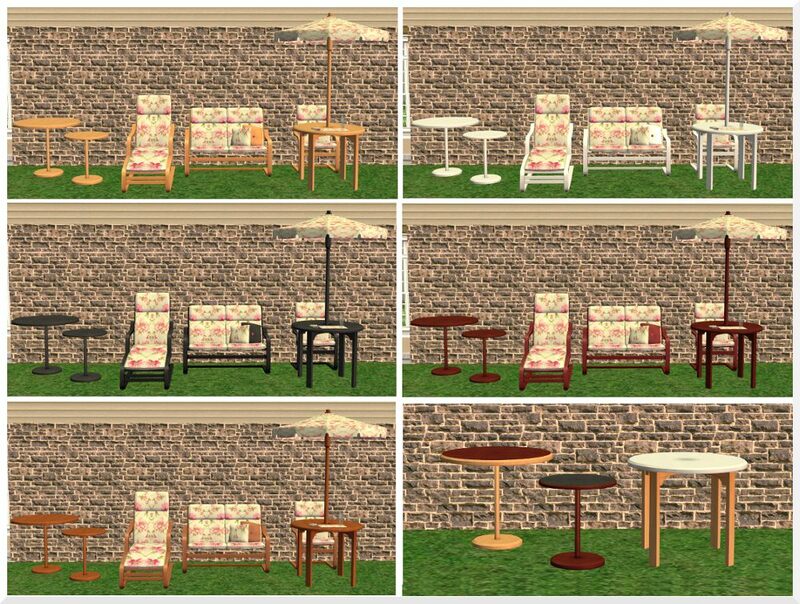 You're also able to arrange dining chairs 1/2 a tile away around the fire for sims to sit on--or in the fire for that matter--without them catching on fire. And the best part, thanks to leesester, is it's as close to base game compatible as I could make it. You have to have at least one expansion pack to use it but it doesn't matter which one. 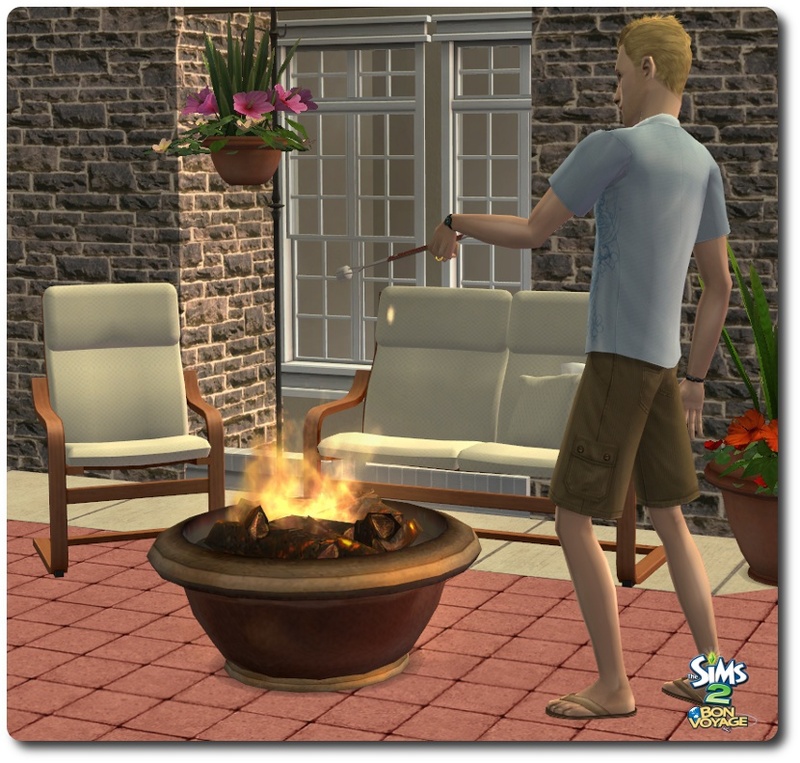 You can't use the eye dropper on the Sims 3 fire pit--you'll get the rusty drum fireplace instead. You also can't buy it on apartment lots without cheats. Part 1 of 2 - Also requires the Fire Pit Skewer. Cloned from Numenor's fireplace templates. Roast marshmallow BHAVs by pacotacoplayer . Part 1 of 2 - Also requires the Marshmallow BBQ Fork. 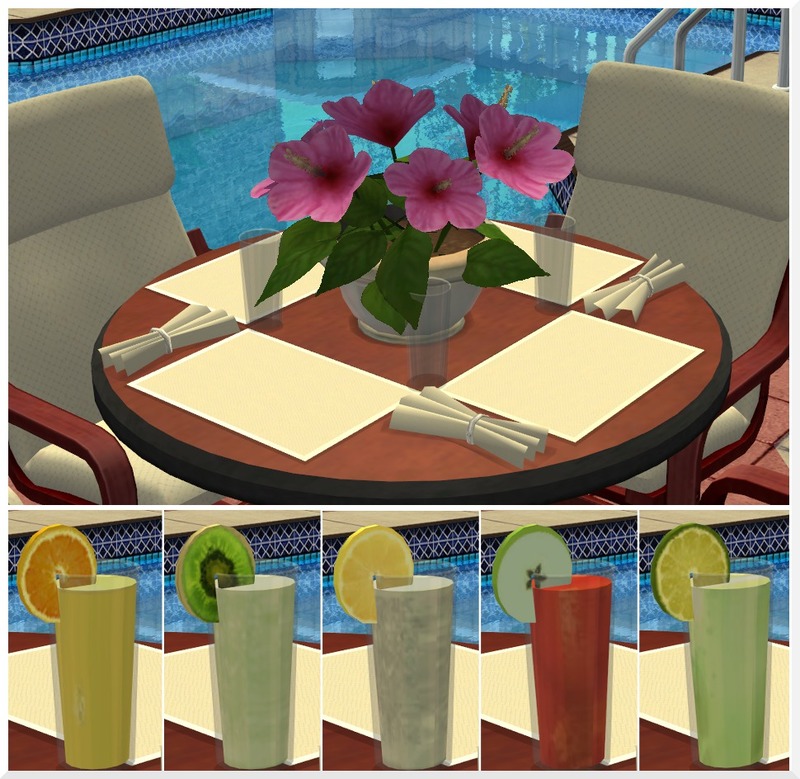 A place setting with a full and empty state for the glasses. This is one of the objects that I was super excited about a year ago because it was something challenging for me and seemed pretty darn cool back then but there's only so many times you can change the state of the glasses from full to empty before it loses its appeal but I still like them and use them all the time. These were cloned from a light which gives, I think, a nice look to the drink texture but they do glow in the dark which might be considered an issue. And because I do want them to have that lit look the catalog thumbnail doesn't show the full state of the glasses but if you toggle to night mode in the buy catalog (just like the lights they were cloned from) you can see the full state so you know which you're getting. I also listed the glass order in the description so you can tell which you're buying that way too. And lastly, with Echo's help I was able to de-link these from the lights on your lot (so they don't turn on and off when you use the "All" light options) but I wasn't able to get them to stop changing states at 6 & 2 with the auto lights. Truthfully, I didn't even notice until my final play test of these that they were doing this, and since this is a hobby and not my job, I'm fine with switching the states back to where I want them if I notice but everyone else might not be? I don't know, totally up to you if you want these or not. In addition, the fruit mesh and orange texture are by bienchen83 @ MTS. If you have Pets and you play with boolprop testingcheatsenabled on, one or more of these objects may cause a reference to tree table entry that does not exist error when a stray dog or cat visits your lot. I've had it occur with just an end table on a lot--which has absolutely no bhav changes--and with every combination in between but it's never occurred without this group of cc installed either so to be on the safe side I thought I'd mention it here. It doesn't happen every time a stray visits but if it does happen you can hit reset (probably more than once) so the stray can continue to do what strays do when they visit or you can hit delete which will remove the stray from your lot entirely. It's an annoyance that I'd love to fix and I've spent countless hours trying to pin this down but I can't figure out what's causing it let alone know what to do to fix it so unless that changes the only "fix" for now is to remove the CC if you experience this and it bothers you. It's also worth mentioning that all of the textures are actually part of the object package and are not recolors so you shouldn't use the trash can in game to delete these. The best way to remove these is to delete them from your downloads folder. Also, these files have not been run through the Compressorizer which I know is popular with downloaders so if you use that program you'll want to do that. This is a deliberate decision so the people who like to customize their downloads can do so without issue. The thanks are lengthy and sincere. First, thanks need go to Gwenke33, SilentLucidity, pacotacoplayer, bienchen83 and julsfels for allowing me to use their work. I'd also like to thank those who answered the multitude of questions posted on the forums for this project over the last two years. Looking back those questions ran the gambit from textures to bhavs and I can't tell you enough how much I appreciated you all taking the time to help: maybesomethingdunno, HugeLunatic, leesester, and Echo. I'd also like to thank the people in the Creator Feedback Forum who playtested a couple versions of the fire pits and/or offered valuable feedback: levini, wgroome, Neder, Amylet, mustluvcatz and Michelle 111--sorry this took so long to upload! And thanks to MTS for providing everything you'd need to learn how to create for the sims from start to finish and for hosting our projects when they're done. SimPe, CEP, Wings3D, Milkshape, WesHowe's Plugins & Tools for S2 & S3, GIMP, AGS, s3pe, s30c and Postal. I recently had to replace my computer and after having to reinstall all of these programs I have a new appreciation for the many people over the years who've made it possible to create for the sims. Most of the textures used (and already credited) are from EA but I used textures from www.cgtextures.com as well--a great resource. 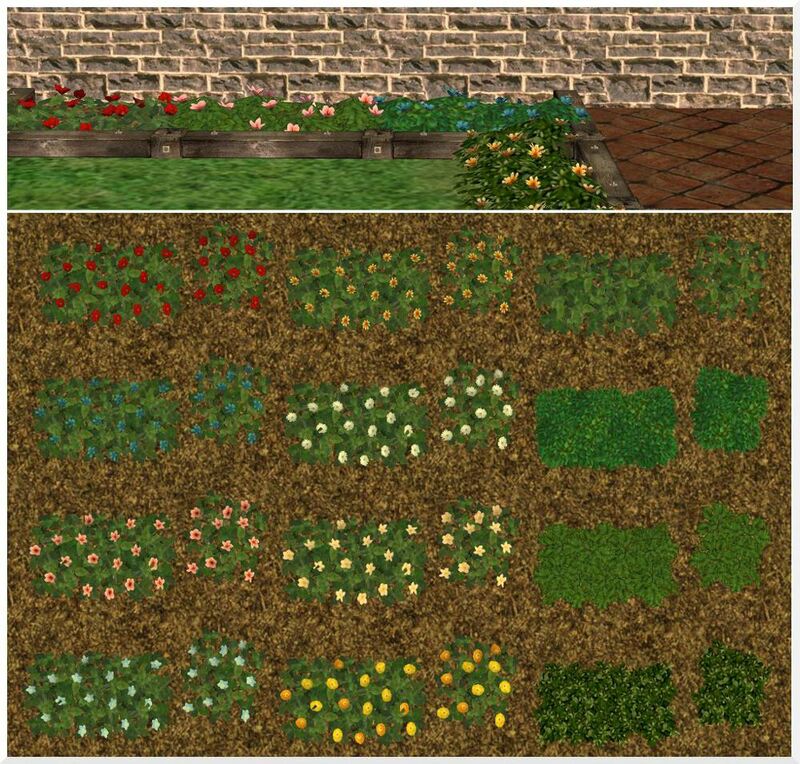 HW_gardenplot_SSN-Required.zip | Description: Seasons garden plot for planters. 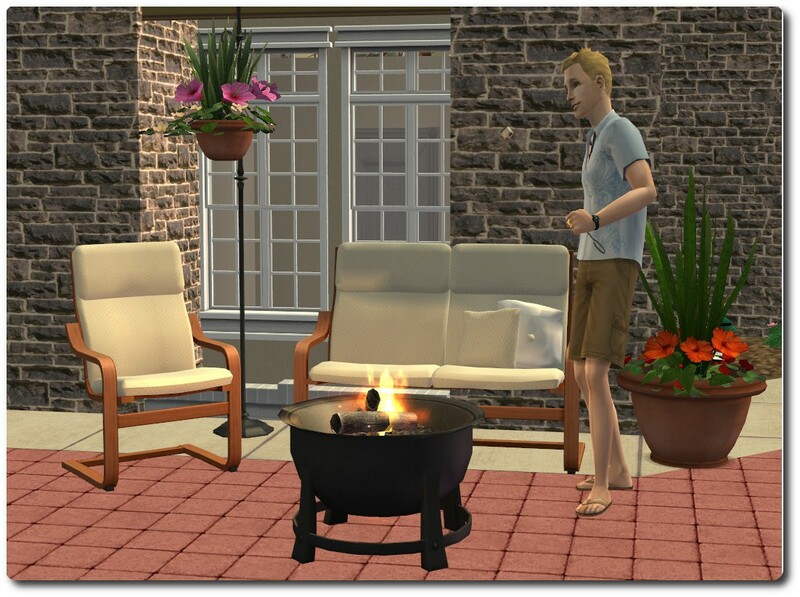 HW_firepit_EP-Required.zip | Description: Sims 3 fire pit converted for Sim 2. Requires an expansion pack but it doesn&#039;t matter which one. HW_firepit_BV-Required.zip | Description: Fire Pit that matches the planters. Bon Voyage required. Jonesi_BedBlanket_mesh_fixed.zip | Description: You only need this if you don&#039;t have Jonesi&#039;s blanket and you haven&#039;t followed the link to get it.